This shows Winter Harbor, Maine as viewed from Frazer Point near the entrance to the Schoodic Peninsula section of Acadia National Park. Frazer Point provides parking, a picnic area, (seasonal) public toilets, and a 40-foot pier with a 20' x 20' floating dock for public use. For thousands of years, this was the location of an Indian summer campsite. It is named after African-American Thomas Frazer, the area's first non-Indian settler. In the Gouldsboro census of 1790, Thomas is listed as being settled here where he established and operated a Salt Works company to sell salt to passing ships. 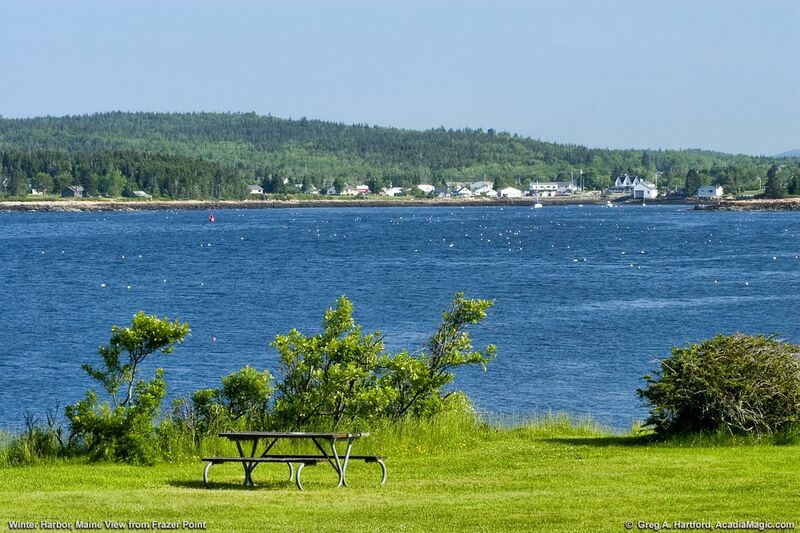 At that time, Frazer Point and the rest of Winter Harbor were part of the municipality of Gouldsboro. Please Note: The Frazer Point bathroom generally closes mid-Oct. The only year-round flush toilet is at the gatehouse as you enter the Schoodic Institute campus.